In an attempt to ease the life of D programmers, I decided to write an utility which would automatically convert the D documentation, distributed with DMD, to an HTML Help project. It was an interesting task, and through some effort I managed at automating the creation of an usable CHM file. The program doesn't make many assumptions on how the help files are laid out, so it will probably work with future D releases. The only exception is that the program uses Kirk McDonald's keyword index, since I didn't find a reliable way to find where respective keywords are explained in the documentation. The full unmodified source of that wiki page is embedded in the program source, so it should be just as easy to update. skip Google AdSense ads, which don't make any sense in offline media - browsers don't (and shouldn't) allow uploading contents of local data to web services, thus Google AdSense displays rubbish/Chinese ads anyway. enjoy your brand new d.chm ! Alternatively, you can download precompiled CHM files. Don't expect these to be always up-to-date with the latest D versions, though. To read the CHM file, you need some kind of CHM viewer. The Microsoft CHM reader (usually located in C:\Windows\hh.exe) comes included with every Windows version since Windows 98. For non-Windows operating systems, there are many free and open-source CHM readers on the web. 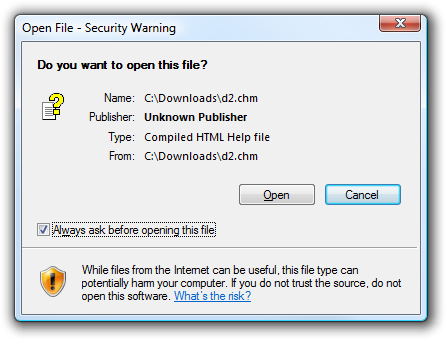 If you see a "Navigation to the webpage was canceled" error page instead of the HTML content, you have to uncheck the "Always ask before opening this file" checkbox on the "Open File - Security Warning" dialog. Alternatively, click the "Unblock" button on the file's "Properties" dialog. adding Tango docs for an all-in-one D help file? I release the source code (chmgen.d) to the Public Domain (no rights reserved). However, the contents of the included wiki page is distributed under FDL.